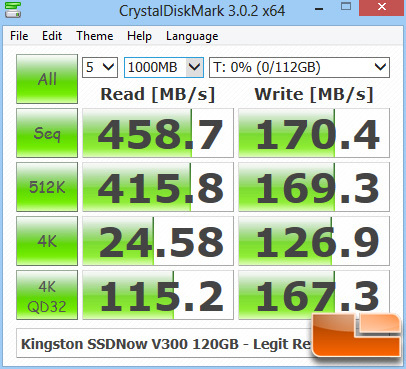 Benchmark Results: Like the AS-SSD benchmark, the CrystalDiskMark benchmark uses incompressible data so the sequential write score suffers for the V300 but again the random scores are good and the sequential reads are dead on specification. Along with the move to a new platform, we decided to make a change in one of the benchmarks. There’s a relatively new benchmark called Anvil Storage Utilities that is in beta but close to production. It’s a very powerful tool that measures performance through a variety of tests which can be customized. 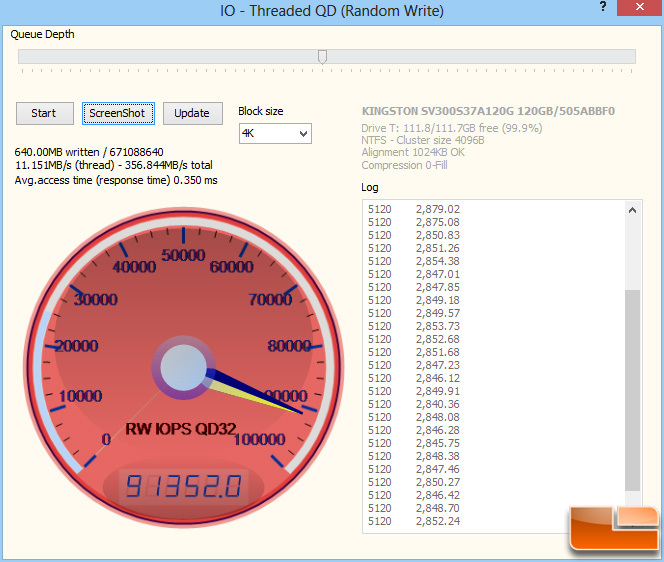 Since some of the tests more or less duplicate what we get from other benchmarks we use already, we decided to use the IOPS (Input/Output Operations Per Second) testing on 4kb file sizes at a queue depth of 32. 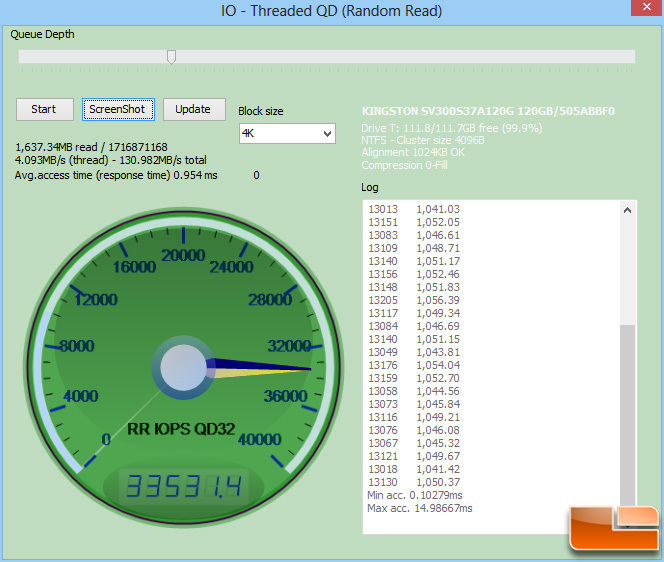 IOPS performance is something SSD makers tout quite a bit but we generally don’t do a lot of IOPS testing because frankly a lot of users can’t relate to IOPS metrics as well and it tends to be more meaningful to the enterprise/server crowd. Still, it is another performance indicator with relevance and while some drives post good MB/s numbers, their IOPS scores aren’t always commensurate which this test will prove out. 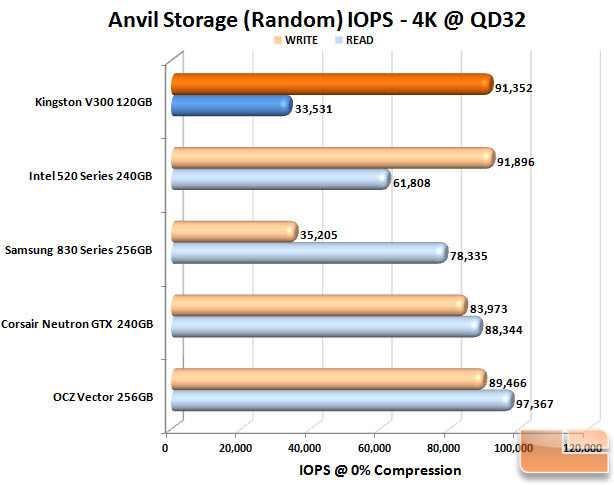 Benchmark Results: The IOPS scores are great here on writes and a bit below the specifications on reads. It should be noted that this test uses 100% compressible data and when we ran the same with incompressible data, the write scores dropped to 40k writes and 20k reads.